A naturally, gentle formula. Adsorbs and eliminates gas. Safe for long term (or daily) use, with no side effects. Does not irritate the stomach. 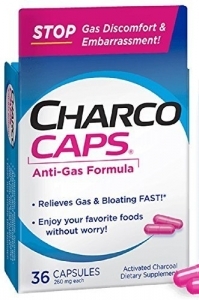 Stops gas discomfort and embarrassment. Fast relief. Enjoy your favorite foods without worry. Take two capsules with cold water preferably after meals. Repeat after two hours if necessary. Do not exceed 16 capsules per day.